What is happening in our markets? How important is sustainability to us? How do we collaborate with partners? How do we work with communities? What are our main projects? This Reporting centre is not part of the 2014 Annual Report and Form 20-F.
We are building an energy future. Shell plans to continue to invest in innovative technology, talented people and the development of new energy sources that will be vital to meet rising long-term demand, while limiting carbon emissions. Our strategy seeks to reinforce our position as a leader in the oil and gas industry. We focus on a series of strategic themes, each requiring distinctive technologies and risk management. Our Downstream organisation is made up of a number of different business activities, part of an integrated value chain, that collectively turn crude oil into a range of refined products, which are moved and marketed around the world for domestic, industrial and transport use. Our Upstream businesses explore for and extract crude oil and natural gas, often in joint arrangements with international and national oil and gas companies. This includes the extraction of bitumen from mined oil sands which we convert into synthetic crude oil. We liquefy natural gas by cooling it and transport the liquefied natural gas (LNG) to customers around the world. We also convert natural gas to liquids (GTL) to provide high-quality fuels and other products. Shell is one of the industry's pioneers in the deep-water oil and gas business. 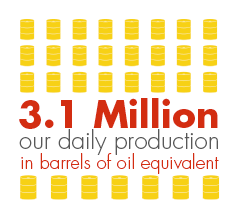 We work to develop new oil and gas supplies from major fields. For example, in 2014 we began production projects in Malaysia, the USA and Nigeria. Resource plays, such as shale oil and gas, are a potentially significant opportunity for the oil and gas industry globally. We are looking carefully where we can add value to this part of the industry. This strategic theme covers the Arctic, Iraq, Kazakhstan, Nigeria onshore and heavy oil plays. In these areas, Shell has access to large resources positions – typically in oil – but there are issues that can slow the pace of development. Yearly average prices are based on daily spot prices. The 2014 average price for Japan Customs-cleared Crude excludes December data. The chart provides an overview of the main crude oil and natural gas price markers Shell is exposed to. We expect oil and gas prices to remain volatile. 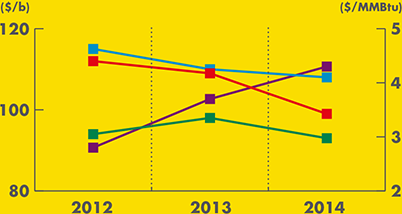 Shell’s CCS earnings improved in 2014 compared with 2013, largely thanks to our prudent investment strategy and delivery of major new projects around the world. 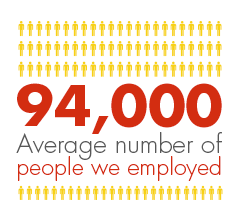 In 2014, Shell employed an average of 94,000 people in more than 70 countries. We have a culture that embraces diversity and fosters inclusion. Our role in sustainability is to help meet current energy demands in a responsible way. We have a long track record of building partnerships with environmental and development organisations to bring insights to our work. Collaborations help us to address a specific need in communities where we operate and also to raise operational practices within our business. How do we engage and share benefits with the communities near us? Community engagement helps us to find better solutions, build people‘s trust and is the basis for operating responsibly. number of people from the country who are employed on the project. We continue to work on indicators to help us better assess the effectiveness of our community engagements. The Carmon Creek project, which began construction in 2013, is an in-situ heavy oil project that is expected to produce about 80,000 barrels per day (b/d) of bitumen using enhanced oil recovery methods. The Corrib natural gas field lies about 83 kilometres off the north west coast of Ireland, about 3,000 metres under the seabed and in waters 350 metres deep. First gas is expected to flow from Corrib in 2015. The Bonga field, which began producing oil and gas in 2005, was Nigeria’s first deep-water development in depths of more than 1,000 metres. The floating production, processing and storage facility will be moored over the Prelude gas field, located more than 200 kilometres off the coast of Western Australia, where it will produce, liquefy and store gas for shipment.